Balanced Forces before Constant Acceleration – Physics! Blog! I know you’ve been there. Stuck in the doldrums of kinematics. So there you are. Stuck in description-land. The juicy parts of physics (explain and predict) are far away and out of reach. You can easily spend ages and ages there. The students start to think that physics is kinematics, and have no idea the beauty and power that awaits them. It drags out longer and longer. You’re obsessing over motion maps or equations, distance versus displacement, but it’s really not even clear why we’re learning about constant acceleration when we have no idea why it’s special and deserves its own consideration and unit. We’re itching to use the word force, or the idea of momentum, but those ideas are out of reach. We have no explaining principles yet, and no way to make physical meaning of things. We’re just describing, describing, describing our lives away. 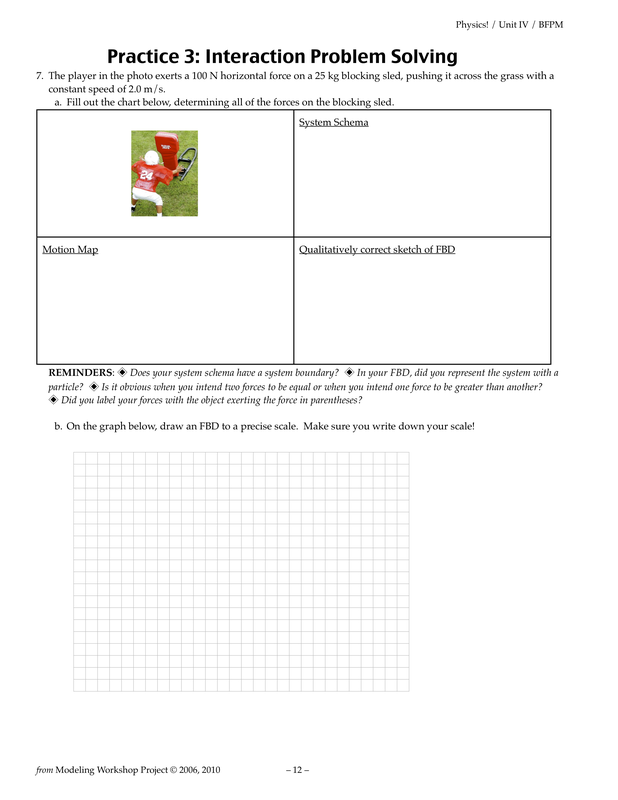 After the paradigm investigation in my balanced forces unit, we start off with a truly excellent 5-page activity that I got from Matt Greenwolfe. It’s 5 versions of the same problem with just slight changes to the situation each time. It essentially involves a box that you first push along a rough floor, then let go of while it is already moving. Students draw system schemas, FBDs, and velocity-vs-time graphs for each stage and altered scenario. We whiteboard them as board meetings (every group whiteboards the same problem, then we circle up and argue it out until we come to a consensus). Drawing the v-t graphs really pushes students to come to terms with the rule they’ve just invented (Newton’s 1st Law). When the forces are balanced, their v-t graph must look like the graphs they were just drawing in the constant velocity unit. When the forces are unbalanced, the graph must look different from that (have a non-zero slope). We decide pretty quickly to use straight-line segments for our graphs (instead of curvy segments) so that we’re comparing the simplest representations. Even though they haven’t studied constant acceleration graphs yet (nor do they even have the physics definition for the word acceleration, so they’re not using the word), it is pretty obvious how to draw a graph with an increasing or decreasing speed. Through the slightly changed scenarios, they also start to put together an idea of how “close” the line will be to being constant velocity (zero slope) or how “far” from constant velocity (very steep) based on how “close” or “far” the forces are from being balanced. We’re starting to develop a qualitative feel for how the unbalanced-ness of forces is related to the slope on a velocity-vs-time graph. That velocity-vs-time graph slope seems to have a meaning that would be worth spending some time investigating soon, huh? Later in the BFPM packet, we get to the problem that originally gave me the idea that BFPM just makes sense as a lead-in to CAPM. The football player problem (also via Matt Greenwolfe) is just a killer. Here are the packet pages. It starts out innocently enough, with a really straightforward (and by page 12 in the packet, usually rather simple for the students) balanced force problem. Check, check, check, and they are off and running past page 12 in a hurry. Then comes page 13, and (in the whiteboarding at least), we screech to a halt. We start playing variations on the football player’s theme. Part c (what if he pushes with more force, but Ff doesn’t change?) isn’t too tough. He’s going to speed up, right? Parts e and f are similarly straight-forward. Sure, I can trick a few students on those parts (we’re still just learning about balanced forces, and it takes quite a while to really internalize N1L). Part d (what should the player do to go from a constant 2 m/s to a constant 3 m/s? ), though, consistently leads to one of the best whiteboarding discussions of the year. While they are first encountering the problem on paper, most groups will come to the same conclusion (just push with 3/2 as much constant force, duh), and they’ll get there quickly and without much discussion. A couple of groups will be really bothered by it, as they have two ideas that both seem like they must be true. On the one hand, “push with 150 N” seems like it has to be the answer. On the other hand, don’t the forces have to be balanced for the sled to move at a constant velocity? The whiteboarding discussion gets all tangled up in those thoughts. Eventually, they will draw good velocity graphs or motion maps that show what must be happening, then they draw FBDs that must match the sections on their motion graphs. Then they come to an answer. But! What force does the player have to exert while the sled is in the “speeding up” part of the graph? 150 N? More than 150N? Less than 150 N? Several arguments and graphs later, they get to an idea that anything more than 100 N will make the player speed up, but the higher the force (above 100 N), the quicker he’s going to get to 3 m/s, so the steeper the slope on the graph. And bam! Motivation for building the constant acceleration model is now complete. 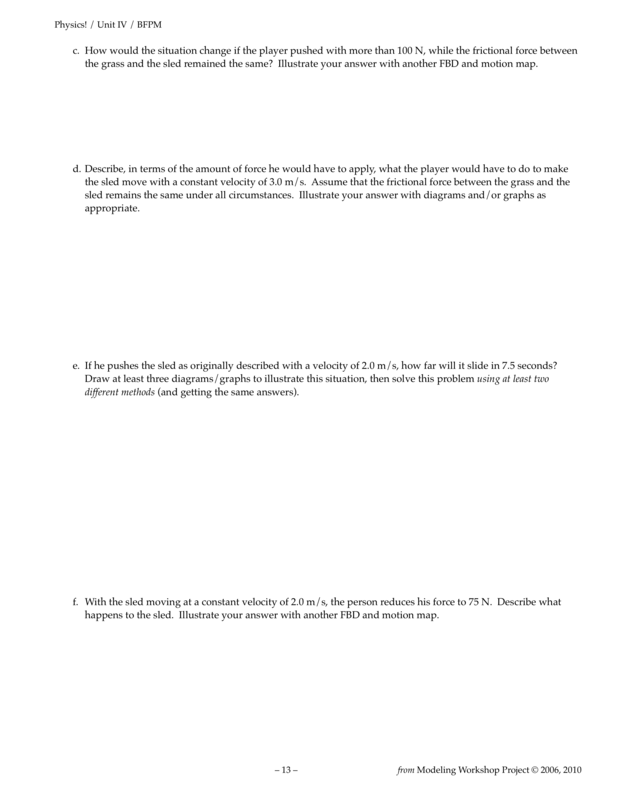 Moreover, students enter the exploration of non-constant velocity-time graphs with really good ideas about the meaning of them, having already practiced drawing graphs for objects that speed up and slow down, and with an idea of how they’re going to be able to use them moving forward. When I used to do CAPM immediately following CVPM, they never had any of those on their side. By the way, Matt’s materials are about to be moved to a new Internet home, which is why I haven’t linked to them above. I will update this post with a link to those materials once they have settled themselves in to their new abode. Forces creep into the conversation throughout the unit. From the beginning with the constant acceleration paradigm experiment (which I wrote about in my model-building post for the constant acceleration model), to drawing diagrams during the “mini-goalless problems” in the problem solving section, to pattern-finding while drawing kinematics graphs. 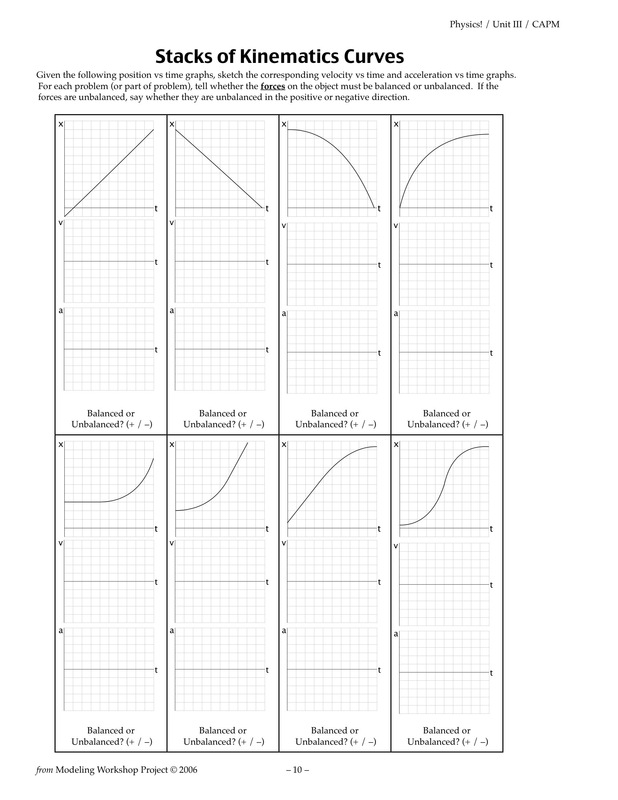 Here are the Stacks of Kinematics Curves pages from last year’s packet. We work through these graphs and whiteboard them in two rounds (about a page at a time with the different problems split among different groups). This was a great activity even back when we did it before forces, but it becomes even more powerful with the addition of that last piece (are the forces balanced or unbalanced (and if unbalanced, in which direction) during the time shown on the graph?). Balanced or unbalanced is pretty simple for them by this point (constant velocity? balanced! not constant velocity? not balanced! ), but the direction the forces are unbalanced is a tricky thing to decipher. Different students have different ways of coming to an idea about it, but the most common way to think about it that the forces are unbalanced in the same direction as a speeding up object and in the opposite direction of a slowing down one. The really cool part, though, comes during the whiteboarding. As the examples start to accumulate, and as we settle into agreement about the correct sets of graphs, at least one student in each class usually starts to see a pattern: the sign of the acceleration always seems to be the same as the sign for the unbalanced forces. We keep checking each new example to see whether it fits the pattern. I don’t push this idea on them at all, and I’d leave it alone if no one at all started bringing it up, but it’s really very cool. Now they have an idea about the steepness of the velocity-time graph being related to how unbalanced the forces are, plus the sign of that slope being related to the direction that the forces are unbalanced. You can just feel the energy rising toward a really big idea, can’t you? After a recent Twitter discussion with Joe Kremer, I’m also mulling over the idea of actually adding an Fnet vs time graph to the stack instead of just asking whether the forces are balanced or unbalanced (+/-). That could be great priming for the momentum transfer unit down the line, and it would be more visual than what they currently do. It would also be easier to show the situations where the forces are unbalanced, but not always in the same direction. In any case, with the qualitative beginnings of a model for how unbalanced forces change the velocity of an object, the investigation of a quantitative relationship (the paradigm experiment in the next model, unbalanced forces) a very natural next step. The stage has been set to start building UBFPM. Of course, there’s not One Right Way to learn physics. This post is just a way for me to share a small change that has made a huge difference for my classes, hoping that it might help others, too, or instigate good discussion/questioning about sequencing. It has certainly (and thankfully) kept me out of the kinematics doldrums for the past couple of years. I think it’s a bit faster for my classes, overall, too, since the constant acceleration unit isn’t the brick wall for my students that it used to be in the old order, but I just have a feeling about that, nothing so concrete. So that’s my sell. Get to explaining and predicting more quickly—remember that any CVPM concept that is a little fuzzy will be practiced in BFPM and examined in more detail in CAPM, so you don’t need to spend much time with constant velocity at all before you’re ready to play with interactions. I’ve been plagued by the kinematics doldrums for the past couple years – such a dull first impression of physics for the students. I think this year I’ll try out the sequencing you suggest. Thanks for the idea! Love the blog and I’ve been stuck before. I remember my second year, when I finally got a copy of Hewitt and he said (paraphrasing) “Don’t spend more than two weeks, it’s not worth it and they’ll pick it up later) which helped me but always left me dry. I’ve been thinking of placing momentum between acceleration and balanced forces, but couldn’t quite make the jump. I like this a lot as it stays more continuous but provides explanation. It helps with one of my main goals in physics- making it not a math class, but something with real meaning! I’m totally switching up the order in my regular physics classes this fall. I’m starting with energy transfer, then constant velocity, then momentum transfer, then finally back to balanced forces. I’m really excited about it, but also a little nervous. It will definitely get to the explain and predict verbs a lot faster, for one thing! hey kelly! Been thinking about doing this. Would you mind sharing your packet? I’d like to try to do something similar with my 9th graders. Certainly! I have all of my materials available as PDFs on Scribd. I’ve collected the links on my physics materials page. If you want editable versions, just let me know, and I can add you to the share folder (I will send you an email with some instructions if you want that). Kelly, my district blocks access to scribd at school, would it be possible for me to get access to your shared folder. Thanks for being inspiring. I noticed in your 2013 collection you plan to kick things off with ETM — at least for your Physics! class. While I have immense respect for the efficacy of modeling and the research that supports it, I know little about what independent variables they explored before settling on the constraints and constants. Some seem adamant that the progression of units is central to Modeling’s efficacy, and I understand that changing the order means the research supporting Modeling may not apply, yet I wonder how much better it could be if we continued to experiment with some of the central ideas (like the order of units) and posted our findings. Have you considered recruiting a bunch of “O’Shea” disciples to conduct some research of your own? Oh no! I didn’t mean to deflate you. Of course you can do whatever order with your classes makes most sense to you. I just mean that if you’re hoping to follow me closely, the 2013 materials and supplemental blog posts won’t be as up to date or filled out as the old stuff, and also that I know the old stuff works pretty well, while I have no idea what will happen this year. If you decide to go with a different order, please let me know how it goes/is going along the way! You’re very sweet to be worried about deflating me, but have no fear. I’m over-inflated with excitement, eagerness and most likely hubris too, so it will only do good. I beg to differ about your qualifications to do research. I feel like I’m qualified to do research and I’m not 1/2 the teacher you are (refer to sentence #2 above). In my masters classes we were required to conduct “action research” which has a very different goal and character than traditional research. It does not require the level of structure and rigor that establishes confidence and credibility of formal research, but it affords enough to make it useful for other teachers to go beyond just reading what you do, to see what kind of results you have and the likely shortcomings and breakthroughs you discover. You could cobble together a respectable piece just by combining posts you’ve written and layering on a little more analysis of your results. Of course, if it’s compelling it might warrant a formal in-depth study, and your action research might form a seed crystal for someone pursuing their doctorate or something. Just a thought. Maybe to put in your bonnet until January or so. I’d be interested in working with you on that, if it develops that way. I’m swamped until January, so I won’t be much use until then anyway. Thanks again! You’re a godsend. I like what I see, and I’m tempted to try your sequencing. One thing I’m wondering is how did the students/class decide that the v vs. t graphs with unbalanced forces should look straight instead of curved? Also, I like the idea of thinking about the normal force in atoms crunching rather than the deductive model I’ve used in the past. Feels more concrete. That’s a great question. There’s usually a little bit of debate about that. Since we don’t have a good way of determining it yet (though we’re getting motivated to figure that out soon), we decide to just go with the simplest thing that will convey the idea of the velocity changing. So we basically agree to use straight line segments for that reason and to investigate it more closely when the opportunity arises. Can I also get a link to your folder with editable documents? You have amazing things on your site!! Thanks for sharing so much and for your awesome ideas! I’m looking forward to trying some new things this year! Hi Kelly. Thanks for your huge helpfulness in posting your materials. For the BFPM what is your paradigm experiment? What experiments do you do for this model? You can see the model-building experiment that we do in Building the Balanced Force Model. We also do some empirical force law experiments in the middle of the unit (Fg, Fs, sometimes Ff), though I haven’t had a chance to write posts for those yet. I would love to see some more on those empirical force labs. I noticed two photos in your 180 series, with students measuring the length of a spring on a table and a suspended spring scale with massess attached. I’m very curious how you deploy those. I love the narrative style of your paradigm lab posts… Thank you for all you do! Hi Kelly, my colleague and I have toyed with the idea of forces before acceleration for a few years now, for the same reasons you talk about, but we never did anything about it. Your post has convinced me to jump in this year and try it. Thanks! Yay! Let me know how it goes! 🙂 I’ve done this a few times now, and it’s pretty great. We’re in the middle of Balanced Forces in my Honors classes right now and will be started Constant Acceleration next week, motivated by the velocity graphs with slopes that we’ve been drawing for times when the forces are unbalanced. 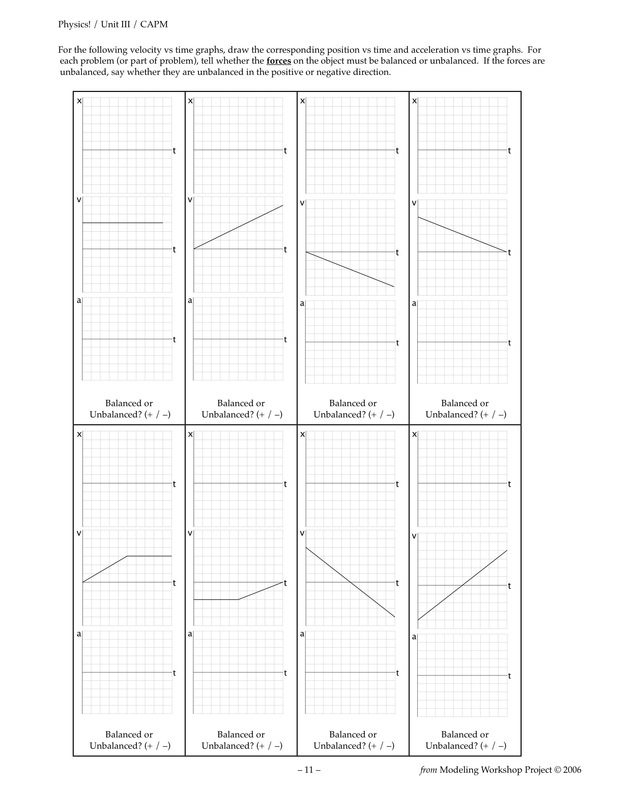 Stacks of Kinematics Curves as a Card Sort – Physics! Blog!